Find easy to understand answers to the most frequent asked questions in gate repairs here. How do I use the intercom to let visitors in? 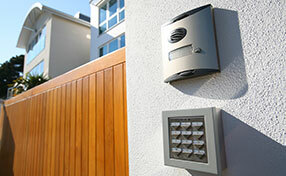 If you want to monitor and confirm the people at your gate before allowing them entry, Gate Repair North Hollywood experts suggest that you have an intercom installed in your gate. This will allow a visitor to press a button that will alert you of his presence. When you have confirmed that they can access entry you can push a button on your intercom receiver that you have inside the house. If there is power outage, what happens to my automatic gate? If there is power outage or the power has been cut, your automatic gate will still function. It comes with an emergency manual override feature that enables you to manually operate your gate while there is no power. Other automatic gates also have battery back-up systems that extend the functionality of your gate until batteries are drained. You need not worry; you can still open and close your gates. Does an automatic gate opener consume a lot of electricity? Gate openers typically operate only a few times a day for a few seconds. They do not generally consume a considerable amount of electricity. According to our specialists, it would be best to have the opener maintained regularly so the electricity consumption would be minimized. How can I operate my gate system manually? Our specialists in Gate Repair North Hollywood suggest that you only manually override a gate system during an emergency. If the gate system refuses to work, just look for the clevis pins on the opener's arms. When you remove the pins and clips, you should be able to open or close the gate manually. 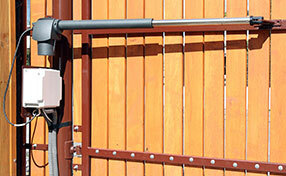 Is a sliding gate better than a swing gate? 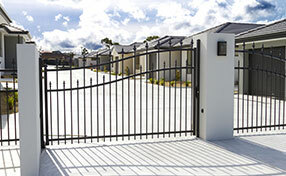 Sliding and swing gates both have their share of advantages and disadvantages. However, for our gate experts in North Hollywood, sliding gates are generally better because they offer more advantages in terms of overall footprint and gate service maintenance needs. They also tend to be less prone to typical wear and tear, especially solid sliding gates. What is the average lifespan of a regular residential gate? Five to ten years is the universal average range. This is based on the collective ratings of the parts that come together to form an entranceway. With proper handling and regular maintenance checks, one can ensure that a residential gate (of any type) functions for years and years to come without giving any hassle. Additionally, predicting the actual lifespan of a gate is impractical because of a gate’s mechanical disposition.